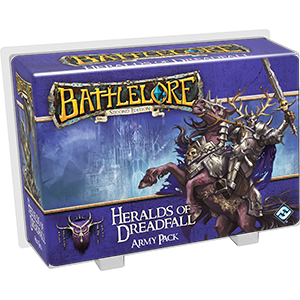 Drain your enemies’ strength with Heralds of Dreadfall, an Army Pack expansion for BattleLore Second Edition. The Undead faction grows as mighty Death Knights, disembodied Wraiths, and a flying Barrow Wyrm join the Reanimates and Skeleton Archers to wage war against the living. A Plagueland hex and new Blight mechanic weaken your enemies, while a complete twenty-card lore deck provides you with an arsenal of cunning tactical tools. Use two army cards featured in Heralds of Dreadfall to deploy powerful armies or invent others designed for your strengths as a commander– everything you need to field a terrifying Undead army is included. You can also combine the units of Heralds of Dreadfall with those of Terrors of the Mists to muster Undead armies beyond your foes’ imaginations.